Many students of world history would be aware of the security treaty between Australia, New Zealand and the United States of America dated 1 September 1951, commonly referred to as the ANZUS Treaty. The ANZUS Treaty was an Australian initiative and, although it has undergone some changes in the way it operates at a practical level successive Australian governments have accepted that the ANZUS treaty underpins Australia's national security. Of course, it does not only benefit Australia; the United States (US) clearly sees value in the treaty. Although many articles and papers have appeared about the circumstances that gave rise to the creation of ANZUS and of its potential effect in range of scenarios, few commentators appear to have acknowledged that the ANZUS Treaty was not the first Cold War agreement for mutual defence and support between the US and Australia. In 1950 Australia appreciated that the United States Navy (USN) was the dominant naval power in both the Pacific and Indian Oceans. However, experience from World War II had shown that, from an operational perspective, Australia was a long way from the US headquarters (either on American soil or in Japan), and even further away in terms of US strategic thinking. Furthermore, the Korean War was underway and there was a general intensification of the Cold War, especially in Asia with the recent creation of the Peoples Republic of China in 1949. The possibility of another world war was very real, and Australia faced threats to its security, including to its maritime trade. As is the case today, maritime trade was fundamental to Australia's security and prosperity, yet there was no certainty that the US either would or could assist if our maritime trade was threatened. At the time, any analyses of potential threats to Australia's strategic interests effectively equated to threats to British interests, and were soon concentrated on the Malay Peninsula. Consequently the threat to sea lines of communication in British South East Asia resulted in the creation of the Australia, New Zealand and Malaya (ANZAM) Region in 1950. This region largely overlapped with the Royal Navy's Far East Station and the Australia Station, and was centred on Singapore. With the declaration of ANZAM came the establishment of a higher command structure that would operate from Australia (and be largely Australian-staffed) in the event of war. ANZAM itself was not a treaty but rather an agreement between participating naval forces on certain higher command functions necessary for the protection of maritime trade. Its overall intent was to establish a coordinated Allied response to any attacks on merchant shipping within the ANZAM Region. Understandably, its creation was viewed by the US with some concern. The US has never entered in treaties of mutual defence and support lightly. In 1950 it did not view Australia as within its area of responsibility, nor did it believe it should in any way automatically safeguard Australia's sovereignty or its interests. The declaration of the ANZAM Region, however, affected that position at a practical level. 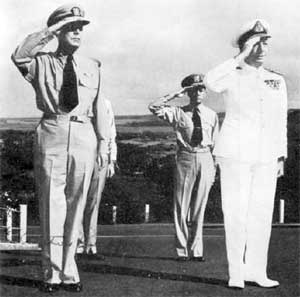 Within the US Government, neither the State Department nor the Joint Chiefs of Staff formally altered their view of the relationship between Australia and the US, but at the Headquarters of the US Pacific Fleet in Hawaii the declaration of the ANZAM Region could not be ignored. Australia's then Chief of Naval Staff, Rear Admiral John Collins, had been seeking agreement with the US Pacific Fleet since 1948 on a raft of matters, all of which were linked, one way or another, to agreed procedures for trade protection, reconnaissance and anti-submarine warfare operations in the Pacific area. The US Pacific Fleet staff had politely informed him that it was not interested in discussing such matters. The declaration of the ANZAM Region forced a change in that view as the region overlapped with the US Pacific Theatre, and the very real possibility of confusion and administrative conflict between allied navies in the event of war was obvious. Further, ANZAM locked the United Kingdom (UK) into the Pacific area as a strategic power, whereas the US had a very firm view as to which nation was to be the strategic power in the Pacific (it should be remembered that the UK would not become a nuclear power until late 1952). As the ANZAM staff was to be supported by and based in Australia, the Commander-in-Chief US Pacific Fleet (CINPACFLT), Admiral Arthur Radford, was obliged to deal with Australia and specifically Rear Admiral Collins in order to resolve these issues. Fortunately, from Australia's point of view, the US Government held no strong views on Australia and CINCPACFLT was granted a free hand to resolve such matters. As a result of discussions between Admiral Radford and Vice Admiral Collins (promoted May 1950), an agreement was reached in March 1951 between Radford on behalf of the US Pacific Fleet and Collins on behalf of what was termed 'the ANZAM countries' on command and control issues in the Pacific and Indian Oceans areas. Thus the Radford-Collins Agreement was born. Early versions of this agreement have now been declassified (and published by the Sea Power Centre - Australia) but care must be taken when reading them, not only to establish what they are but more importantly what they are not. The first point to notice is that the agreement is not a treaty; it has never been executed on behalf of any nation nor has it ever been ratified by any parliament. It is a working level agreement between allied senior naval officers and it was designed to be a practical arrangement between the USN and ANZAM (not with Australia alone) when all parties were fighting a common enemy. Consequently, Rear Admiral Collins signed on behalf of the Royal Australian Navy, the Royal New Zealand Navy and the Royal Navy. Second, the agreement predated the signing of the ANZUS Treaty by about six months. In due course it would become the best known 'ancillary arrangement' between the US and Australia under the ANZUS Treaty, but it was never designed as such. Third, the agreement covers most of the Indian Ocean and all of the Pacific Ocean, which reflected the reality of naval power at the time. Most of what are now sovereign nations in this area were then colonies of European powers or heavily under their control. Most others were under the control or influence of the US. Australia and New Zealand themselves had barely achieved sovereignty (in some measure) from the UK; while South East Asia and the Pacific contained few sovereign nations. The area of responsibility assigned by the agreement reflected the (then) capabilities of the navies concerned and, in the case of the US Pacific Fleet, the disposition of its task forces. Lines were drawn on maps, through islands and across large areas of ocean, not because there were any territorial claims but because this was a naval - as opposed to a military - agreement, which divided up responsibility rather than purporting to grant some form of control. The agreement made each navy responsible for ensuring the free flow of maritime trade in its area and in conjunction there was a requirement to maintain maritime reconnaissance, prosecute enemy submarines and employ local defensive measures; in essence, to take whatever actions were required to protect maritime trade. Finally, the agreement was designed as a combined forces working document from which all exercise and operational planning could commence; it did not constrain any of the navies involved from undertaking independent operations as required by their governments (certainly the US Navy has never felt itself so constrained). One of the most surprising aspects of the agreement is its brevity: although a large number of topics are covered (from the establishment of Major Area Commands to common publications for operational and tactical use) most are dealt with in one short paragraph and the entire agreement (less its maps) is less than seven pages. Yet it was the acceptance of what appears to be mundane administrative procedures and common publications that is the Radford-Collins Agreement's strength. It requires a common form of command structure with common procedures and a clear understanding of what information was to be passed between each navy. In other words, from a headquarters point of view, what staff would be required and what responsibilities they held. Based on the agreement, personnel training could be organised and regular international exercises conducted. While this may sound somewhat boring and mundane, it is precisely the standardisation of such 'back office' functions that made the agreement so valuable and enduring. If Australia and the US faced a common maritime enemy there would be no need for discussion on how each navy was to interact with the other at the strategic and operational levels; the agreement resolved those questions. The procedures and communications links established by the Radford-Collins Agreement were regularly exercised either in the context of larger multinational exercise or with specific command post exercises such as the appropriately named RIPCORD, ROLLER COASTER and ROLL CALL series. More recently exercises have been conducted as part of the EXPANDED SEA and (the current) BELL BUOY series. The Agreement itself has shown the utility of generally establishing inter-navy agreements on topics such as trade protection procedures; such experience resulting in the formation of what is now known as the Pacific and Indian Ocean Shipping Working Group (PACIOSWG) encompassing not only Australia (which also guards for New Zealand) and the US (which also guards for Japan) but also Chile, Republic of Korea, UK, Canada, and more recently South Africa and Singapore. The world has changed a great deal since 1951, perhaps more, from a geopolitical perspective, in the Pacific and Indian Oceans than anywhere else on the globe. The UK is no longer a major naval power in the region (although does retain a strategic interest in the area), sovereign nations have replaced former colonies, and both China and India are emerging as major economic powers. The Radford-Collins Agreement, however, has evolved over time and still exists - coordinating areas of responsibility and administrative functions for the protection of maritime trade. The concept of Naval Control of Shipping (NCS), which relied on positive naval control of merchant ships, has now given way to Naval Cooperation and Guidance for Shipping (NCAGS), which relies more on cooperation with the merchant marine and is based on advice rather than control. (Importantly, NCAGS is not limited to the Radford-Collins Agreement, and is conducted by navies in the region and around the world.) The underlying essence of the current agreement, however, has not changed. It still speaks of responsibility, common procedures, cooperation and communication built on the foundation of the parties to the agreement facing a common threat. It is interesting to explore how an inter-navy agreement, born of the Cold War but also in response to another similar agreement (ANZAM), could have both survived and remain relevant. It says much of both the quality of the original agreement and the need for it - a need that remains as relevant today as it was 50 years ago. ↑ There was a major shift in dynamic in the 1980s when the New Zealand Government legislated against nuclear powered or armed warships visiting New Zealand ports, effectively preventing US Navy ship visits. ↑ The ANZUS Treaty has only been invoked on one occasion, when on 14 September 2001 Australia declared that as a consequence of the attacks on the World Trade Towers in New York three days earlier, it had formed the view that the US was under attack and, consequently, Australia was obliged to come to its aid. ↑ See David Stevens, 'A Critical Vulnerability: The impact of the submarine threat on Australia's maritime defence 1915-1954', Papers in Australian Maritime Affairs No. 15, Sea Power Centre - Australia, Canberra, 2005, pp. 287-325. ↑ The two declassified versions (1959 and 1967) are reprinted in Andrew Forbes and Michelle Lovi (eds), 'Australian Maritime Issues 2006: SPC-A Annual Papers in Australian Maritime Affairs No.19', Sea Power Centre - Australia, Canberra, 2007, pp. 47-67.